It is time to talk about disability and dental care. When you have a disability or special need, keeping up with daily dental care or finding a dentist that can cater to your needs can be quite a challenge. That’s why we sat down with Keith Libou, D.M.D. of Delta Dental of New Jersey. He answers all our questions about disability and dental care in a multi-part blog series. We hope these posts will serve as a useful resource for you or your loved one and give you something to smile about. What are the typical challenges that face people with disabilities and special needs when it comes to maintaining regular dental care? People with disabilities often deal with special dental problems. For instance, they are more likely to have gum disease than those without disabilities. They’re also more likely to have missing teeth. Conditions that may require special considerations in providing dental care include cerebral palsy, Autism Spectrum Disorders, Down syndrome, muscular dystrophy, seizure disorders, vision and hearing impairments, and learning disabilities. Their medications. Some medications have a high sugar content, cause dry mouth, or cause excess gum growth, all things that are harmful to their dental health. Their diet. They may be prescribed a soft or other special diet that is high in starches or other carbohydrates that stick to the teeth and can lead to dental problems. The disability itself. These can make it difficult to carry out dental hygiene habits such as brushing and flossing. Some may have muscle issues or uncontrolled body movements, making it challenging to sit in a dental chair and safely receive oral care. Some people with nervous system disorders experience gastroesophageal reflux, which can erode teeth enamel. People can chip teeth during seizures. 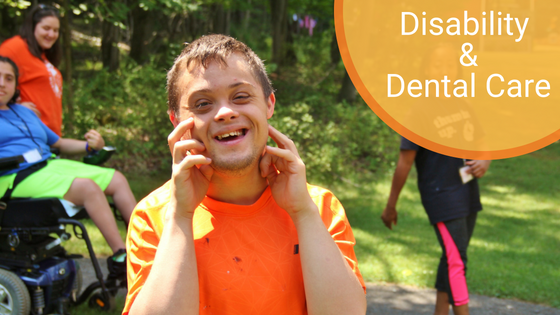 The good news is that access to dental care for people with special needs is improving. Good oral health is important for everyone. And that’s especially true for people with disabilities and special needs. What does “good” dental hygiene look like? Your mouth looks, feels, and smells healthy. That means brushing your teeth twice a day with a fluoride toothpaste and flossing once a day. Together, these steps help prevent cavities, gum problems, tooth loss, and bad breath. When brushing, pay special attention to the gum line. Use a soft-bristled brush and place it at a 45-degree angle to your gums. Brush your tongue, too, to remove bacteria and freshen your breath. Flossing is the single best way to remove plaque from areas between teeth where the toothbrush can’t reach. Plaque is made up of invisible masses of harmful germs that live in the mouth and stick to teeth. Some types of plaque cause tooth decay, while other types cause gum disease. Finally, don’t forget to visit the dentist regularly for an exam and tooth cleaning. During the cleaning, the hygienist removes tartar above and below the gum line using either a scaler or an ultrasonic vibrating device. Then the hygienist polishes the teeth with a lightly abrasive paste and finishes up with a flossing. The now-smooth tooth surfaces make it more difficult for plaque to accumulate before the next cleaning. What are the consequences of poor dental hygiene? But poor dental hygiene also can lead to many other conditions, including gum disease. According to the National Institute of Dental and Craniofacial Research, up to 80 percent of American adults have some form of periodontal (gum) disease. The disease is caused by the natural buildup of bacteria on the teeth as plaque. If plaque is not properly cleaned away, it can infect the tissues surrounding and supporting the teeth. Researchers believe that periodontal disease is associated with health problems throughout the body such as heart attack, stroke, pre-term low birthweight babies, and rheumatoid arthritis. Type 2 diabetes is also associated with periodontal disease, and recent research has shown that diabetic patients that aggressively treat their periodontal disease can have better control of their blood sugar levels. Good dental hygiene contributes to good oral health—and that contributes to good overall health. How can people overcome the challenges associated with dental care and disability so they can keep up with their dental hygiene? It’s especially important to keep up the basics of good dental hygiene (brushing, flossing and regular dental visits). But modifications may be necessary, depending on the disability. They may need their caregiver to help brush their teeth. Or, they may need a modified toothbrush to make the toothbrush easier to maneuver. People have been really creative with this. They’ve added bicycle handle grips or tennis balls to brush handles to make it easier to grip. They’ve used Velcro to attach the brush to the hand. And they’ve lengthened the handles with popsicle sticks. Flossing can also be a challenge. Flossing aids such as floss holders or floss picks can help. Patients may need extra help from their caregiver. 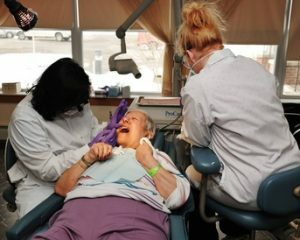 The National Institutes of Health publishes an excellent free booklet called Dental Care Every Day: A Caregiver’s Guide. It provides excellent guidance to help caregivers help someone brush, floss, and have a healthy mouth. It describes step-by-step what to do if the person you care for is unable to brush or floss, even with accommodations. How does diet affect dental health? If you are what you eat, then it’s particularly true for your teeth and gums. When you drink sugary beverages and eat starchy foods, you’re not only feeding yourself. You’re also feeding the plaque that can cause problems in your mouth. Good dental health benefits come from a variety of healthful foods—think fruits, vegetables, whole grains, and dairy products. The calcium in cheese, as well as the calcium and phosphates in milk and other dairy products, help put back minerals your teeth might have lost to other foods. A nutrient-poor diet can make it difficult for the body to perform key functions and may lead to other health concerns. For example, it may be more difficult for tissues in the mouth to resist infection without certain nutrients, which could contribute to gum disease, a major cause of tooth loss. Although poor nutrition is not a direct cause of periodontal disease, many researchers believe the disease advances more quickly and is potentially more severe in people whose diets lack certain nutrients. Pay attention to foods with sugar or starch in them. Sugar is found not only in sweets, but also in fruits, some vegetables, most milk products, and many processed foods—even some that don’t taste sweet. Starch is found in breads, crackers, pasta, and many snack foods. The goal isn’t to cut out all these foods. Instead, aim to choose and use them wisely. Serve sugary or starchy foods with a meal rather than by themselves. Since more saliva is released during a meal, it helps wash food particles off the teeth. This reduces the chance of cavities. Finally, beware of sticky foods such as chewy candies. These foods aren’t easily washed away by a drink or saliva. As a result, they have high cavity-causing potential. What’s the best way to locate dentists who treat or specialize in working with people with disabilities and special needs? Finding the right dentist is important for everyone—especially those whose conditions require special care during dental treatment. Many dentists can accommodate patients with disabilities, and some dentists make special-needs dentistry a focus of their practice. Your family dentist may be the best person to provide treatment or recommend someone who can. Your local dental society and some patient advocacy organizations (such as Autism Speaks) may have lists of dentists who specialize in disability care. Other caregivers are another good source for finding dentists. Once you have a recommendation, you may want to schedule a “get-acquainted” visit beforehand. The patient can meet the dental team, sit in the chair and receive instructions on how to brush and floss. You can assess whether the dentist and staff interact well with you and the patient. If special scheduling consideration is needed, find out if the practice is willing to accommodate you. This is a good opportunity to ask any other questions, as well. Keep in mind that you may need to see more than one dentist over time until you find the right fit. Remember, you and the dentist are partners in the patient’s care. Finding a team you’re comfortable with can keep teeth healthy for years to come. Visit Delta Dental of New Jersey for more information or Easterseals New Jersey if you’re looking for disability services. Dr. Libou joined Delta Dental of New Jersey in 2014. Prior to joining Delta Dental, he served as Chief Dental Officer at Dental Care Alliance (DCA), while also overseeing DCA’s affiliated multi- location group practice in Pennsylvania as Dental Director. From 1998 to 2000, Dr. Libou was Vice President of Operations and National Dental Director at Oral Health Services, and prior to that he served as Dental Director of the Eastern Region at Cigna Dental from 1995 to 1997. Dr. Libou has been a practicing dental clinician and academic. He has strong network management experience and a great understanding of the principles of evidenced-based dentistry and the connection between oral health and the overall wellbeing of an individual. 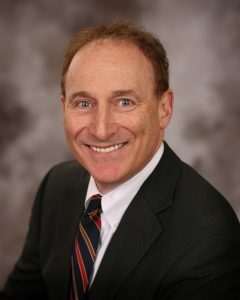 Dr. Libou is directly involved in establishing strategy for Delta Dental of New Jersey to integrate the rapidly evolving evidence about the oral-systemic relationship into its dental benefit programs. He led a pilot program involving dentists performing in-office HbA1c testing for diabetes, and most recently wrote the request to the American Dental Association’s Code Committee to assign a code for dentists to perform point-of-care HbA1c blood testing in dental offices. The code was approved and became effective January 1, 2018. He also has oversight of the dental consultants, professional relations department, and overall network and clinical support. With over 15 years of experience in large group practices, Dr. Libou is licensed to practice dentistry in New Jersey, Pennsylvania, and Connecticut. With experience on both the clinical and insurance sides of dentistry, Dr. Libou brings with him extensive knowledge of dental managed care and the dental benefits industry. Dr. Libou studied biology at the State University of New York at Binghamton and he later graduated from the University Of Pennsylvania School Of Dental Medicine where he earned his D.M.D.